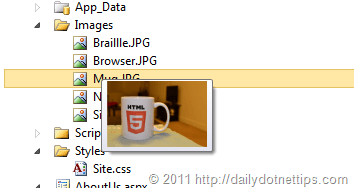 There is a nice enhancement in solution explorer with Visual Studio 2011 to get the image preview while your are hovering the mouse. In Earlier version of Visual Studio, you have had to double click on the images or open the image folder to view the image. Now with Visual Studio 2011, you can preview the images right in the solution explorer rather to double click or open the folder to view it. This is a small enhancement but very useful in terms of developer productive.